Now, I have to give Ele:WoM some credit: it sure has a pretty map. 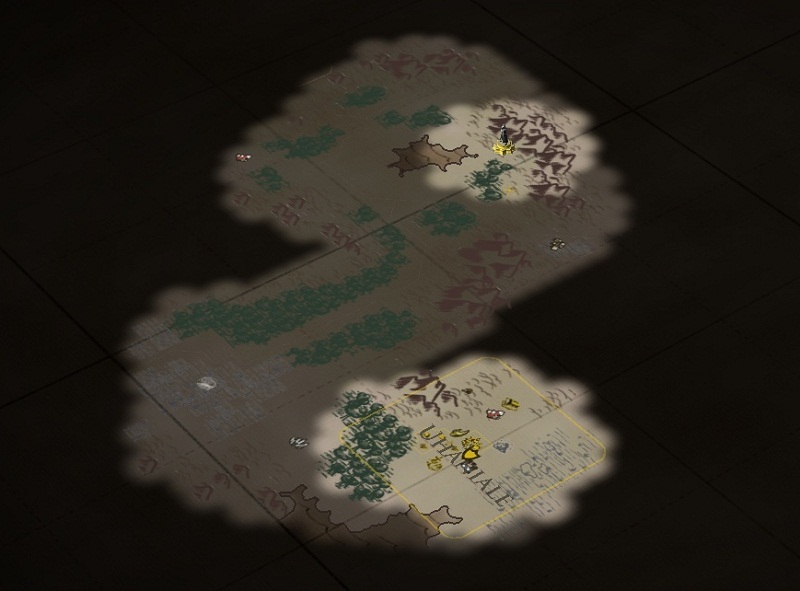 One of the best things about the game: only CiV’s “Settles of Catan” style map rivals it in my opinion. bug sadly, maps aren’t everything, and so far, the game as hasn’t really grabbed me the way other 4x games do. Nothing has really happened. Still, it looks like that’s about to change, as I’ve just made first contact: Karavox from the Empire of Kraxis. There's a lot of black on the screen. Does that mean this guy is evil? 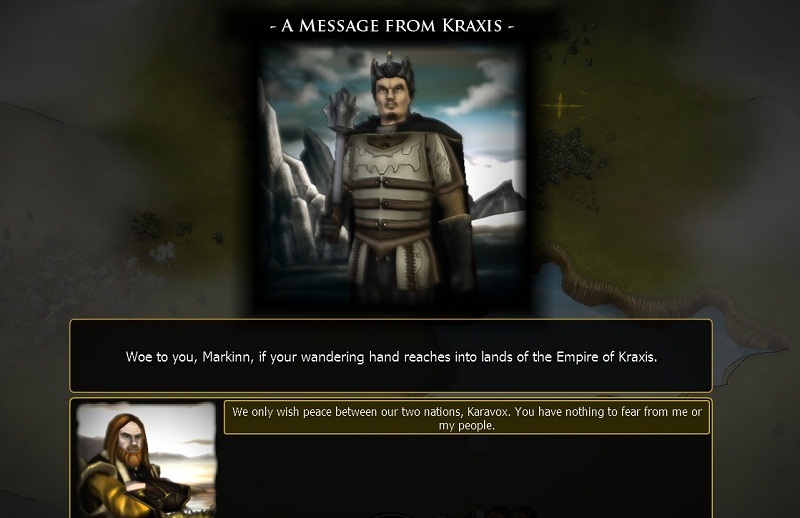 Kraxis is the land of traitors. Its people are mainly descended from the soldiers who comprised the Great Army of Mankind that marched on the Dread Lord Curgen’s fortress at Imperium. They make their living dealing with the very Fallen who slaughtered their ancestors. The majority are settled in and around the port town of Tanacabra, on the Bay of Capacea. So, they’re not to be trusted. 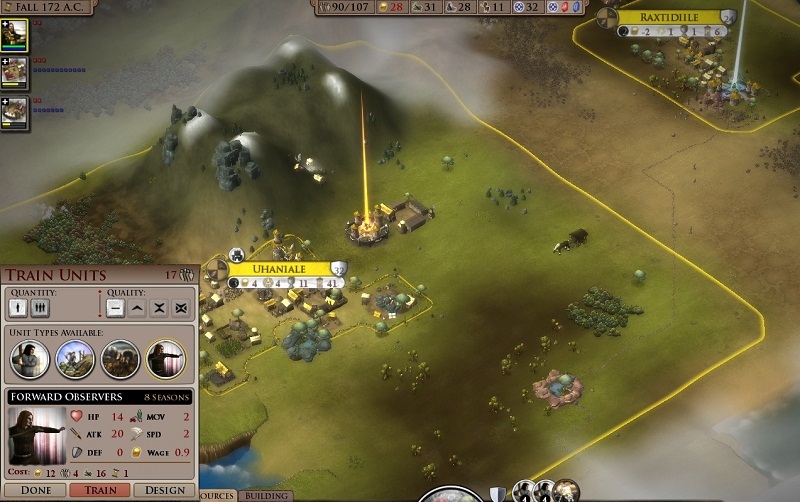 Fingers crossed they don’t realise that my city is currently only defended by some peasants. I decide that it would be a good idea to send Markinn and the two Annie’s home, athough I can’t resist taking the long way round and exploring the south-east. Doing so nets me a few more abandoned caravans, turning up extra matrials, a staff, and more interestingly: a token of a sand golem. This allows me to, you guessed it, summon a sand golem. I wonder what he was doing wandering around in the wilderness? 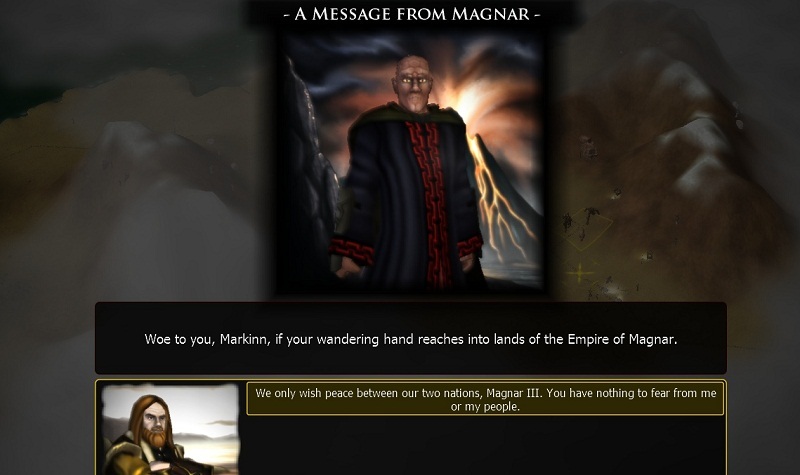 It seems like a no-brainer descision: luckily for me, I have more than enough money as Markinn’s just sold off all the crap treasure that he unearthed on his adventure. (The silver flute along netted me 100 gilder.) Furthermore, it’s pretty good timing as I’m just about to found my second settlement and the +10% production that Highsley provides will help get it off the ground a little faster. 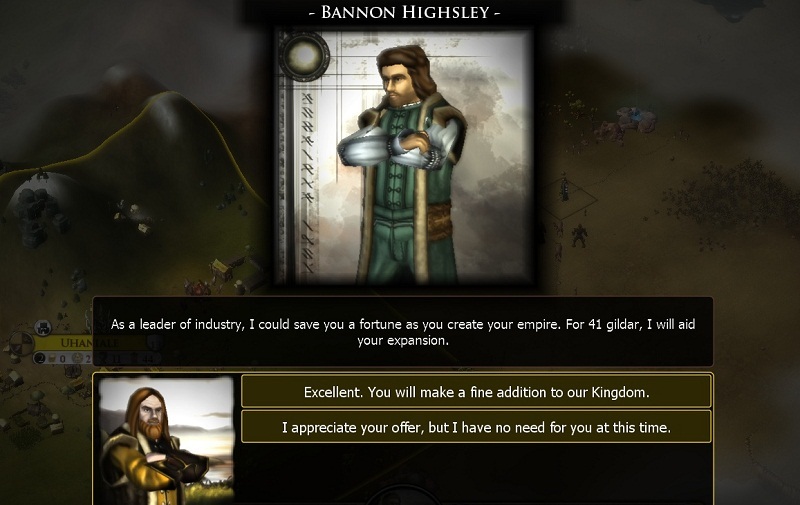 So welcome aboard Mr Bannon Highsley, and welcome to the fledging town of Raxtidille (population 2). I decide to give Highsley one of the two Annies to help him defend the settlement. OK, not what I was expecting, but i guess I’ll be thankful of her if the evil Empires come knocking. 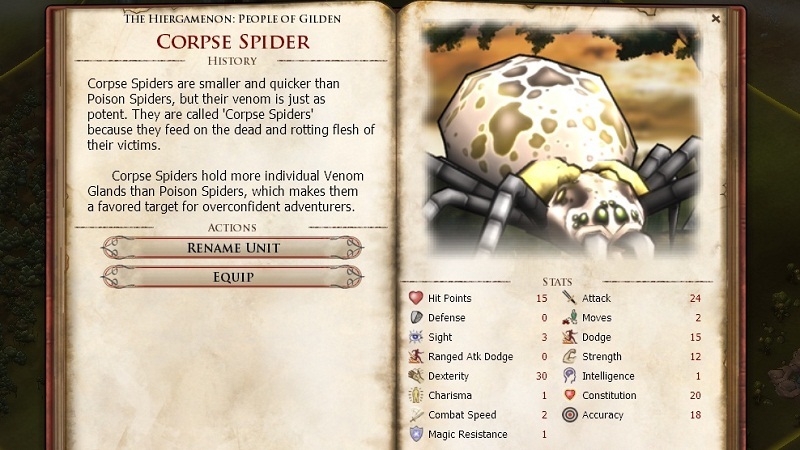 Although, a corpse spider hardly sounds like the sort of noble animal that would be defending the good guys capital. It was Sauron in LotR who had the evil giant spider queen, while the elves had eagles. Oh well, better not be judgemental. Especially as I’ve just made contact with the Magner. He looks like just the sort of evil lord who would have corpse spiders guarding his cities.